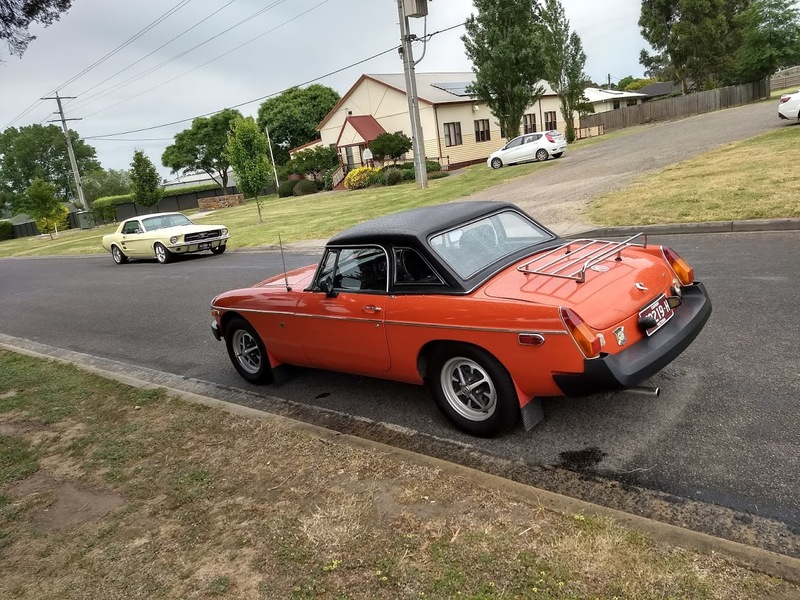 After picking up the Cabriolet on Wednesday from Moorabbin (after a little fettling, as the Poms would say). I decided it would be nice to use it on the Neerim South Mid-Week run. The Targa tops were even removed and stowed away so as to be ready for Thursday morning. Thursday dawned warm, but overcast, so at 10:15am the Jag and I set off for the Stump Tearooms at Darnum. 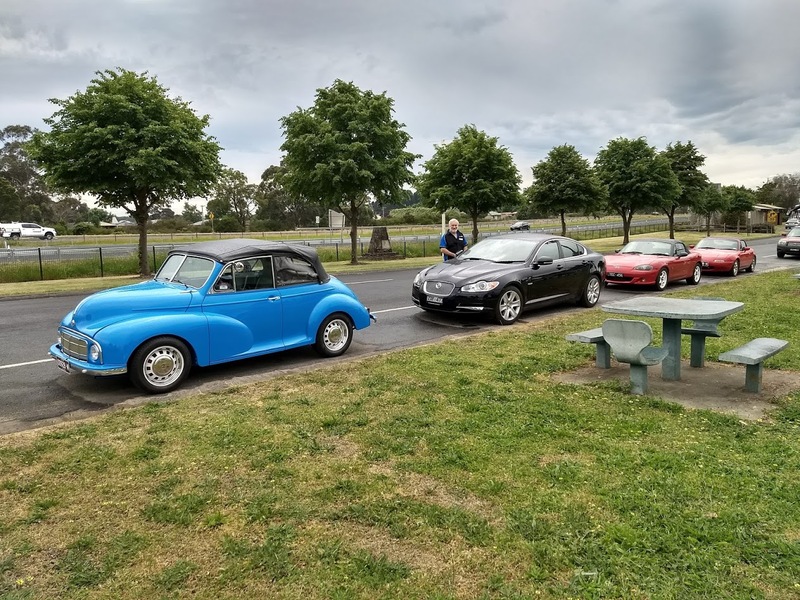 There we met up with other members for a pre-run Coffee, and then in typical Gippsland weather fashion – the drizzle set in. 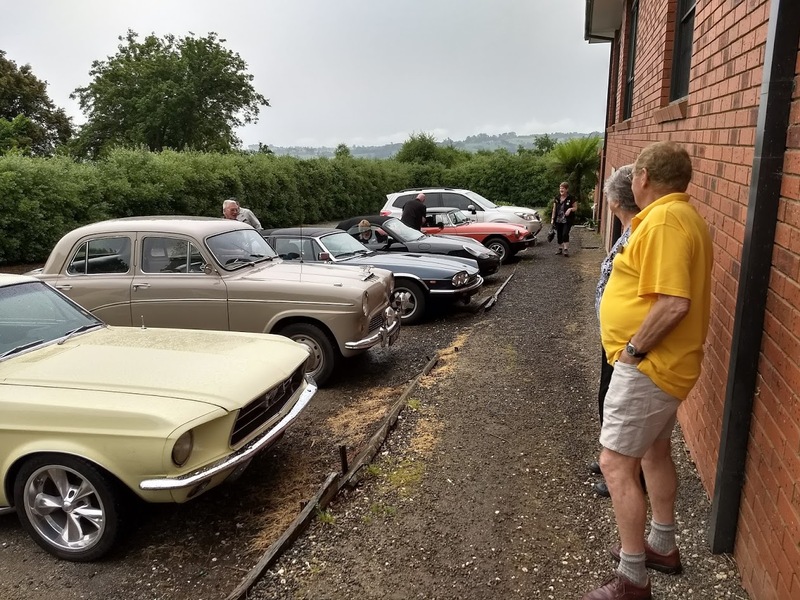 On went the Cabby’s targa tops as others erected the soft tops on the convertibles that were assembled awaiting the arrival of our Midweek Maestros John and Jan! We set off after receiving our instructions from John, along the Darnum Park Road towards the Old Sale Road and Mizpah Settlement Road. These are terrific drivers’ roads with nice scenery for the passengers to admire along the way. Onto McDougal Road, turn right into Neerim East Road, then somewhere along Neerim East Road this ‘dickhead’ left the correct route and led half the convoy down the wrong track. In my defense, the mistake was realised almost immediately, and we turned everyone around. Now back on track, the lost half of the convoy headed for the right turn onto the Main Neerim Road and headed north to the Neerim North Road. 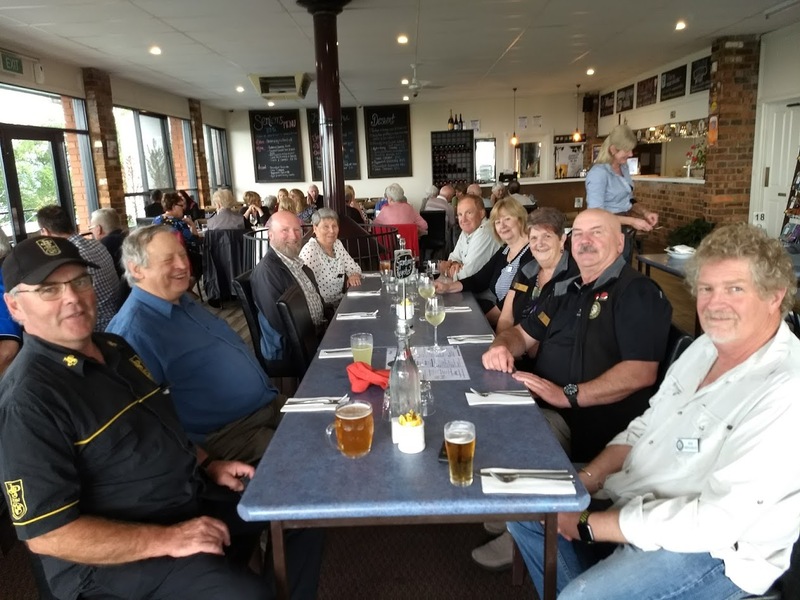 Then it was down into Noojee before finally catching up with the leading half of the convoy at the Neerim South Pub where we had a great meal with great company. Thanks John and Jan for providing us with another great Mid-Week run, and on behalf of the lost convoy, sorry guys! Suddenly RAIN, mad dash to put roof up. John hands out the maps and details of the route, then it’s away. Twelve classics and two modern cars took part. 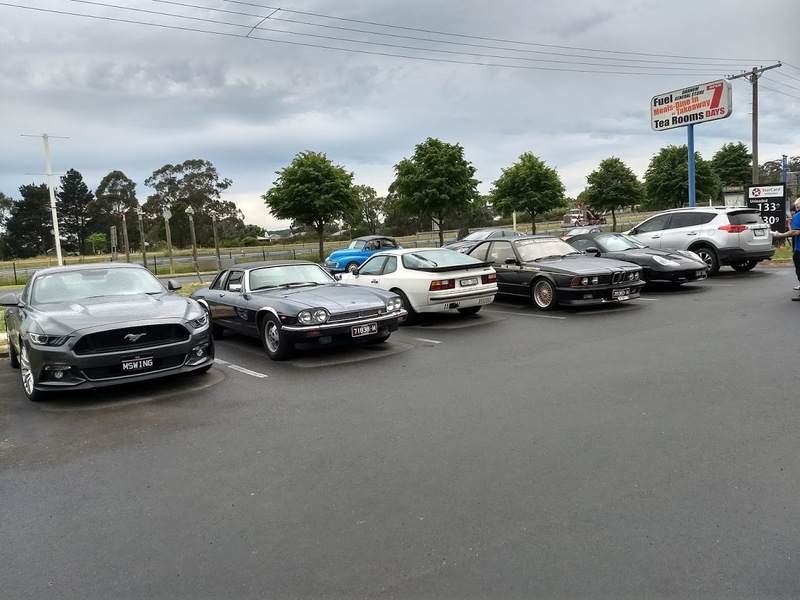 The Morolla, 1 x ’65 and 1 x new Mustangs, MGB, Austin A95, Boxster and a 944 Porsche, XJS and XF Jaguars, JPS BMW, 2 x MX5, a Subaru and a Pajero. We toured some of Gippsland’s beauty, the rolling hills, luscious farmland, bushland and winding roads. 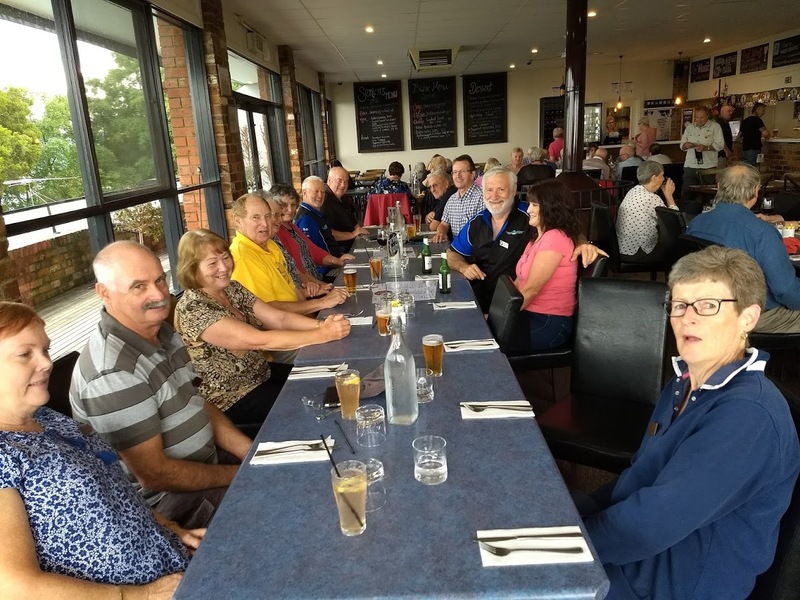 Starting from Darnum then on to Shady Creek, then Neerim Sth, Neerim East, Neerim, Noojee, Nayook, Neerim again and back to the Neerim Sth Hotel for lunch. Traveled on a patches of road at Nayook which appear to be where the Shire apprentices are taught how to repair pot holes !!! Numbers varied upon arrival, but eventually all the others arrived and stories were told. Good fun run was had by all. Morolla has never been this dirty, but we thoroughly enjoyed the day. THANKS again to John and Jan for organising another run.